The Holy Spirit is talked about in many ways, taught in many ways and possibly even mis-taught in some cases. This teaching is to help get some clarity on the teaching of the Spirit. The King James Version translated it as Ghost, but that’s a poor translation. It’s not a ghost and not really even a Spirit. The original Hebrew world means a wind, a breath, a violent exhalation, a blast of breath. The first use of this is in Genesis 1:2. The Greek work means a current of air, blast of breath. John 6:63, the Spirit gives life, the flesh counts for nothing. 1. Wind is unseen. Our faith allows us to experience what is outside the natural world. 2. Wind is unpredictable. For proof, how often are meterologist just wrong? John 3:8. 3. Wind is powerful. Think: tornadoes. We serve a God who longs to pour out His power on all people. 2. Begin to develop an intimate fellowship with Him. 2 Corinthians 13:14 – the intimate friendship of the Holy Spirit be with all of you. Jesus left the earth because He knew that it would allow each of us to walk in it. Isaiah 30:21. This looks like many things in different people’s lives. It can be anything from discernment to audacious faith to miracles to knowledge. The way we begin this process is to simply ask for it. Romans 8:11 – life to our mortal bodies because of God living in us. The book of the prophet Jeremiah in the Old Testament opens with Jeremiah talking about his call to be a prophet to the people. In this passage, as God is telling Jeremiah about the work he is to do, God tells him about the power of His words. 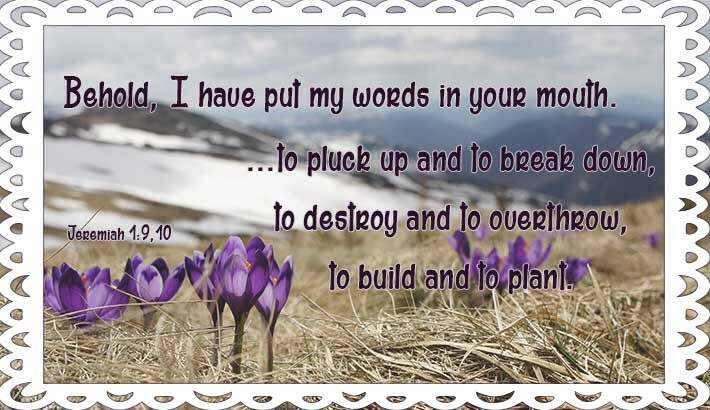 God says that the words He put into Jeremiah’s mouth were, “to pluck up and to break down, to destroy and to overthrow, to build and to plant.” This dichotomy of purpose in the words Jeremiah will speak can be applied to our lives as well. The first thing is to notice that the opposites here are referring to removing and giving. In other words, God will bring into our life, through us listening to Him, a flow of things. Sometimes things will come in, and sometimes things will go out. Ecclesiastes confirms this as well with the passage, “For everything there is a season, and a time for every matter under heaven” (Ecclesiastes 3:1). We need to acknowledge that there is time for being built up and receiving and there is a time for allowing ourselves to be destroyed. Wait, that doesn’t sound right, does it? Why would God want to destroy something in our life? The obvious answer is that sin is in us and needs to be taken out. Seems simple enough, but yet it is often this work of tearing down that we fight. When we think about who we are, we often have an image that God will keep adding or giving or teaching us where we are at. We become more and more like Him and this is how we go for the rest of our lives. Have you ever opened a cupboard or closet door and had things fall out on you? The storage space was too full to hold in all the things that were supposed to be in there. This is what happens to us if we keep wanting God to add and build, but we aren’t willing to let go of anything. What falls out of the cupboard when it’s opened? The dusty things in the back that are covered in other dusty things? No, the thing that we’ve just put in, because that’s what we don’t have room for. If we want God to be giving us new words and new understandings, we must be willing to admit there are things that have to go. When we first become a Christian, this isn’t all that hard. There are many things we can pull out and get rid of. In fact, we feel lighter and lighter as we hand off burdens and cares. He begins to heal us and to grow us. After we’ve walked with the Lord for a while, we start having trouble finding the dusty things that can be cleared out. The trouble is that now the things the Lord is destroying in us are deeper and more personal. Pride stands in the way and says, “That’s not a sin, that’s just my personality!” There are behaviors we do that are driven by fear or selfishness that we’ve done so long, we can barely recognize them as problems. We find that instead of simply removing problem behaviors, God wants to start changing our view of our very identity. He wants us to stop defining ourselves by our past and our troubles and our reactions and instead start defining ourselves in Him. We cling to our identity very tightly. The idea of letting go of who we think we are, even if we know it’s to experience who we could be, is terrifying. But it must happen. He has to have access to destroy anything in the dusty, dark recesses of our spiritual cupboard that He knows is keeping us from being built up. Only then can we be ready to accept the new truth He’s teaching us so we can begin to grow and be built up. He will build us up; He promises. We have to trust Him enough to give up anything and everything He’s asking to destroy from out of ourselves. Proverbs 30:7-9 shows us the troubles of both not having our needs meet and having too much stuff in our lives. On the one side, not having enough tempts us to get what we need in whatever way we can. The flip of that is that we tend to trust in ourselves and our stuff when we have more than what we need. 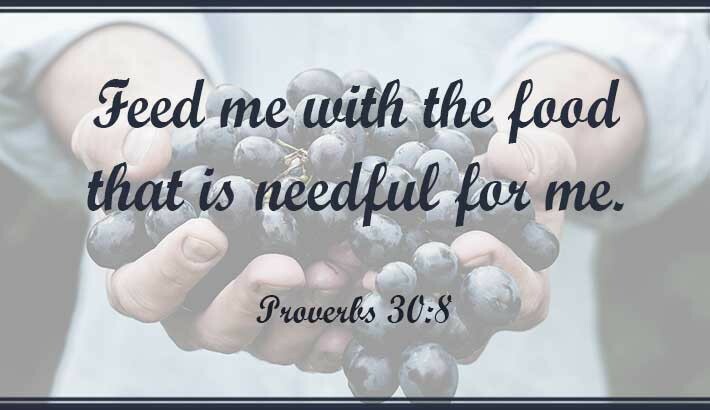 The desire of the author is to be content with what he has, saying, “Feed me with the food that is needful for me.” In order to be satisfied with what we have, we have to know and believe one thing, what we have is what we need. Or, perhaps, we will have what we need. So many things in our lives distract us from what is truly needed in our life. I’m not saying that, since we can live on bread and water, we should never have more than that. I personally don’t call that living. But I also know that I cling to things that I think are valuable or important but that in the end, have no lasting value. In addition, I base my decisions and sense of comfort and stability on some underlying idea of what happened yesterday will happen today and will continue on in the future. We all do this; it’s a part of staying sane in this world. In and of itself, I don’t think it’s a wrong way to think. The problem comes in when we limit our future to what we know and can see. The future is a big unknown and trying to mold it and manipulate it into our way of thinking only ends in disappointment. God holds our days and knows our steps (Job 14:5). We can fully rely on and trust Him to provide for whatever is coming our way. In fact, fighting Him about what we need or don’t need only ends with us having to learn the hard way that He knew what He was doing the whole time. 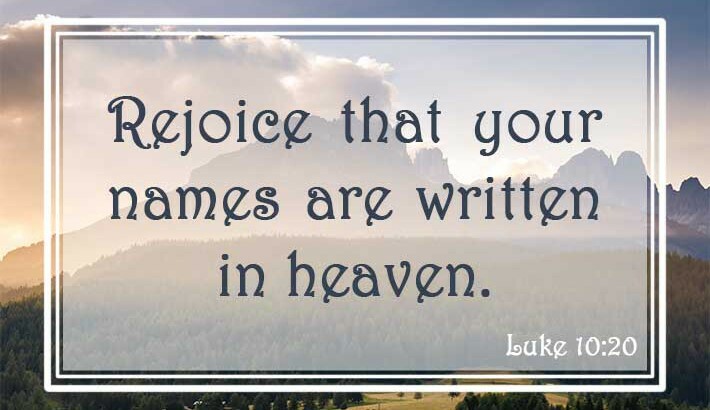 I recently read a fantastic example of this on Ann Voskamp’s blog, A Holy Experience. Her son had some difficult health issues recently and she talks in her entry about the struggle and pain, but also joy and growth that comes through that. God knew this would happen. He knows what will happen and knows the length and quality of Ann’s son’s life. He isn’t surprised or disappointed by the diagnosis her son received. Ann says this, “Grieving how plans change — is part of the plan to change us.” Just because tomorrow brings unexpected news to us doesn’t mean God won’t be there every step of the way. He will provide what is needful for us today, tomorrow and forever. Isaiah says that David was witness to the people and the context of the passage is that God is calling His children to Him. In thinking about what we can learn from the example of David, I want to highlight a few characteristics about David that stand out to me. Of course, there are many characteristics that we can learn from, but I’ve just picked three that stand out to me. The first example I like is David’s whole hearted passion for what the Lord has called him to do. 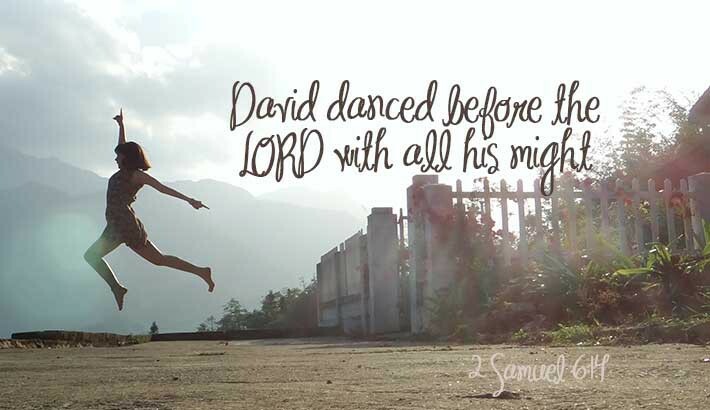 The passage that reflects this to me is 2 Samuel 6:14, “And David danced before the LORD with all his might…” In this story, David is bringing the Arc of the Covenant to Jerusalem and as it’s processing toward the city, David is offering sacrifices and dancing. As I think about the moments that are success stories in my life, or moments of completion, did I dance before the Lord with all my might? When I have celebrated and danced (not literally, I have no skills), did I do it whole heartedly? David dances this way even though the woman who was his first love insulted him for it. He chose the passionate dancing over her (2 Samuel 6:20-23, more on that here). Would I choose passionate celebration of what God’s done for me over the thoughts and actions of those I love? The second character trait of David’s that stands out to me is his fairness. He cared about all his people, not just his favorites. Kings and leader through all of history have taken favorites and given gifts and specials to those they loved over others. David’s fairness defined him and how he handled the results of battles, even when others wanted to distribute spoils selfishly (1 Samuel 30:22-24). I hope that I can stand for the same thing even in the face of loss or the threat of other’s. Fairness is threatened by all sides from all people in almost every walk of life. The opposite of fairness, by the way isn’t inequality. The opposite of fairness is selfishness and inequality is the result. The third trait is his complete awareness of the purpose of his situation in life: for the sake of the people of Israel. David knew that it wasn’t about him. He wasn’t a great guy and that’s why he’d earned these results. God wasn’t extra-especially pleased with David. We can see that when David sinned (think: Bathsheba or the census debacle), God didn’t take away the crown. He punished David and expected him to repent, just as he does with us. But God didn’t give the blessings to David because of his goodness and God didn’t take it away because of his sin. God created David to walk the path that he did because of what God wanted accomplished both in David and the people of Israel. I desperately want to have this view of my life. God made me to do good works (Ephesians 2:10) and He did it because of what He is planning on accomplishing in my life. I need to accept what He brings my way because I trust Him to be fulfilling His plan in me. I am not extra-especially good or extra-especially bad and God isn’t bribing me with good thing or punishing me with bad things as I go along. I am righteous because I accept the salvation of Jesus Christ and have believed on His name and been baptized. Other than that, I’m working to be His servant and accomplish the work He has made me for. When we are seeking the Lord’s guidance in our life, we are often only looking for open doors. “Tell me where to go.” “Tell me what to do.” A question we ask less often is, “What doors are closed?” Often, even if we get an answer that a door is closed, we fight it or feel like we haven’t heard right. Accepting the limitations that God puts on our choices is an important part of walking with Him. The world says, “Make a plan and make it happen.” God says, “Do what I say, when I say to do it.” Apostle Paul demonstrates this in his journey and how he handled ministering in Asia. In chapter 19 of Acts, we learn that Paul spent two years in Asia and it says, “all the residents of Asia heard the words of the Lord, both Jews and Greeks.” Sounds great and wonderful, but if we look back three chapters, we see that Paul didn’t just get this handed to him. In Acts 16:6, it says, “And they went through the region of Phrygia and Galatia, having been forbidden by the Holy Spirit to speak the word in Asia.” Paul accepted that limitation and moved on. He continued following the leading of the Lord even when it contained a limitation. Then, after Paul’s continued obedience, the door that had been forbidden to him was opened. There are areas in my life where right now I have limitations, things that the Lord has asked me to let go of or hold back from. Many, many times I want to fight Him about it. I have many arguments against it, but the usual one is something along the lines of “Everyone else can!” Not the most mature response, I know, but it seems unfair and I don’t understand. God is so good, though, that I’m learning to trust the limitations and accept limitations or withholdings. Not because I think that the point is to do without, I don’t think that at all. My personal opinion is that God doesn’t ask you do without something just to see if you can or if you’re willing to. It always has a purpose in transforming you. So far my experience is that God’s withholding something I want or asking me to not do something is for several reasons. One, protection. God knows how to give good gifts to His children (Luke 11:13), and He also knows what won’t be a good gift. Two, transformation. There are times when getting what I want would block him because I’d turn to something other than Him. By letting Him withhold or limit me, I can choose to be transformed more and more as I lean on Him and wait. Three, focus. There are things in our life that we put above God and rely on more than we rely on Him. God wants us all to Himself and will do what it takes to bring us an awareness of what’s more important to us than Him. (Exodus 34:14). 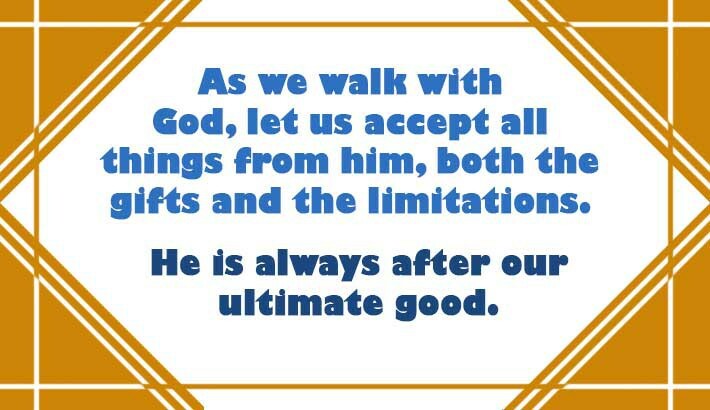 As we walk with Him, let us accept all things from him, both the gifts and the limitations. He is always after our ultimate good (Romans 8:29). None of the things we spend our time on in this life matter at the end of our dsays. When we don’t controlled the pace of life, we open ourselves up to negative consequences. 1. The risk of sinful choices increases. We often make sinful choices is when we’re spiritually or emotionally exhausted. We’re often open to discouragement. One bit of advice is to HALT. Don’t make a decision when you’re hungry, angry, lonley, or tired. 2. I am less productive. When our pace gets off, we feel like we just need to do one more thing, but we don’t realize that we’re chopping ood with a dull axe. Proverbs 19:2. It’s not doing more that leads to productivity, it’s health. 3. It leaves me feeling empty inside. Always seeking more, wanting promotions or seeking material status. Burnout isn’t caused by too much activity, it’s caused by doing too much activity with too little purpose. God has created us to do more than seek after stays or wealth. 1. Stop this constant push for more. Our culture says more us better, but it’s just not true. We show our belief on this by how we spend our money and how we schedule our time. Ecclesiastes 4:6 – peace of mind is the best. We are the gatekeeper of our lives. No one else is going to fight for our margins but is. 2. Keep the Sabbath day holy. This is tightly entwined with stopping the push for more. Exodus 20:9-10 seventh day is for rest. Going to church is not fulfilling the Sabbath. It’s a part of it, not all of it. It’s a whole day and not a Sabbath hour. It starts with worshipping God, and then it’s about finding a way to allow your soul to recharge. We feel guilty because there’s so much to be done, but that guit doesn’t come from the Bible. Don’t let our culture override the can man’s of the Bible. Rest. 3. Stay close to Jesus. Matthew 11:28-30, Come to Jesus all who are weary, angry He will give you rest. How different would you life look if you stopped this constant push for more? In an article called Faith is not a Feeling, author Ney Bailey talks about her journey to understanding what faith is. “After reading and rereading the passage, with all its references to the phrase “by faith,” I began to see that all the people mentioned had one thing in common: No matter whom the writer of Hebrews was talking about, each person had simply taken God at His word and obeyed His command. And they were remembered for their faith…. I love this idea of faith defined so simply and I realized that humility can be looked at in a similar way. “Humility is accepting God’s word about who I am.” Humility is an act of faith in regard to who you are. It’s not trying to be anything else than what He created you to be, or do anything else than He is asking you to do. Faith, while seemingly simple, is very difficult to live out because it requires two things of us: hearing God’s word and accepting it. With all the conflicting voices and ideas demanding our time and attention it is a choice to listen to God and a choice to accept it, no matter what else we hear. Humility is the same way. There are many things that we hear about ourselves. There are messages around us about what makes us valuable and what or who we should be striving to be. We have to choose to listen and accept what God says about us in His Word and choose to act and live based on those truths. Humility keeps us from becoming prideful. It allows us to stay on our knees before the Lord without succumbing to false humility of self-degradation. God doesn’t want us to abase ourselves or grovel like a worm. He wants us to remember who He’s told us we are. To hold to that and let Him teach us more and more about Him and ourselves so He can lift us up and bless us. Bailey, Ney. “Faith Is Not a Feeling.” Starting With God. Web. 23 Jan. 2016. <http://www.startingwithgod.com/knowing-god/what-is-faith/>. Today’s post will be a little different than my usual style. 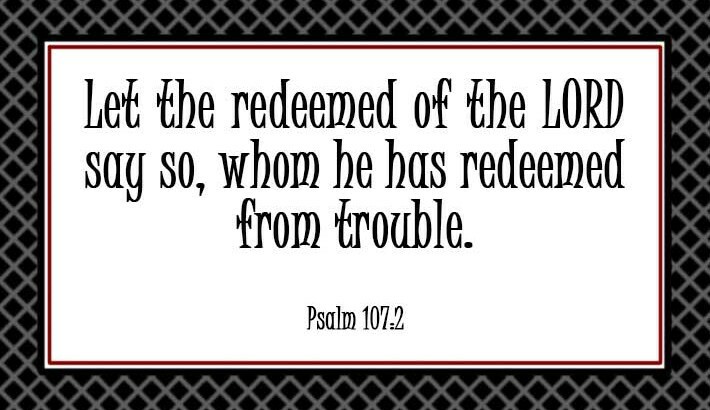 Instead of going over a theological truth, I felt like I wanted to take a moment to live out Pslam 107:2 “Let the redeemed of the Lord say so…”. I am fully convinced that I have an eternal soul that was created before the world and will continue to live past this finite existence. I believe that I was created this way by God because He willed it. God put His beautiful creation, people, on to this earth to live and to give them an opportunity to choose Him. Unfortunately, they chose sin. Because of that choice, all people are now under the curse of separation from God. Loving His children and not wanting to remain eternally separated from them, He created a way to bring them back to Him. 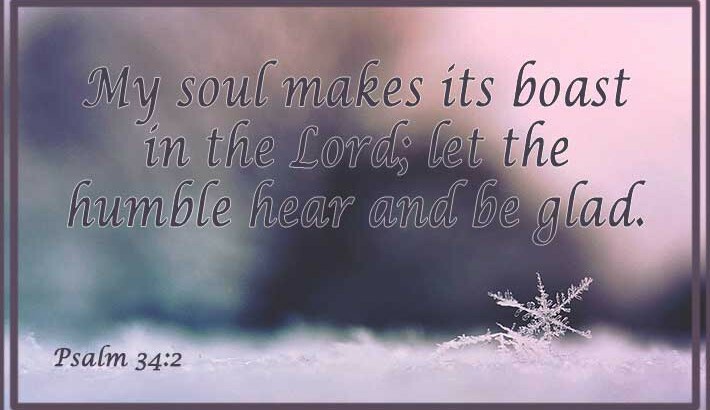 His Only Son, fully God, came to earth in the form of man, Jesus Christ, to break the curse from the inside out. These are my beliefs, but now I’d like to share some of my story in experiencing those truths instead of simply understanding them. I grew up as a conservative Christian in a loving home. I wasn’t a bad kid overall, but I wasn’t very connected with church or God either. When I was getting ready to go to college, my thoughts on church was maybe I’d find something, maybe I’d just enjoy sleeping in on Sunday mornings. Guess which one I chose. College was a rough time of learning to adapt from my conservative background to the world of academia. Because I wasn’t connected personally to God, I stepped away from pretty much all beliefs. I never questioned that God existed, but I didn’t know what to do with Jesus. I threw out the Bible as I thought it was a tool of manipulation, not truth. To be even more honest, I only thought about religion when pressed. I enjoyed a good religious discussion if it came up (from the perspective of not agreeing with it, of course), but I wouldn’t generally start those conversations on my own. My choices at the time were not the greatest ones and I ended up blaming all of college for the bad few experiences of a bad relationship and not fitting in to my chosen major. I couldn’t wait till graduation and all my focus was on surviving till then. After graduation, I ended up doing the one thing I really hadn’t wanted to do: move home. My dreams going into college were to become a great opera singer and move to New York. Ha! I realized that music wasn’t the move for me, so I took a year and worked and tried to figure out life. I didn’t want to go back to my conservative friends and upbringing, but I didn’t have a lot of friends in area that weren’t in that group. I looked around for ways to make new friends and get involved, but I felt lost and adrift. I was also ready for a relationship and was ready to meet a guy who wasn’t a jerk (unlike my last couple choices). I thought about the guys in college that I’d respected and who treated their girlfriends the way I wanted to be treated and they had one thing in common: they were Christians. Not being a dummy, I decided to get myself a Christian boyfriend. However, I couldn’t say that I was a Christian, but I thought that I could get a good guy and then convince him to stop going to church when I got bored with it. Not even kidding. My plan was to attend a bunch of churches until I found one with a fun group of young people and go from there. I opened the newspaper and found the first non-denomination church on the list, called the number and got the service times and address (this was before I had GPS or even a smart phone! ), and showed up Sunday morning. There was one thing I hadn’t anticipated, however. That was that the church I attended had a real and passionate love for Christ and their worship was wonderful and moving. In those first couple weeks, I felt the power of God like I never had before. God was in their sermons and their songs and their prayers. By the end of that summer, I had accepted Jesus as my Savior and committed my life to serving Him. I didn’t even mind that this church had absolutely zero in the young people activity department! Instead, I soaked up God every Sunday, joined a small group, and started learning to live in Him every day. That’s the story of how I recognized that I needed to be redeemed and stepped out in faith. This is just the beginning of my story. I used to think that my salvation experience would be the number one important one for me, but I’ve learned it’s simply the romance that started an amazing relationship. Every day since then I’ve learned more about the Lord and experienced Him deeper and more powerfully. That’s the story that I want to say, and I’d say it to the whole world if I could: This relationship is real and worth it! I am redeemed! In Philippians, Paul advises us to think about the positive things in life. He asks us to choose what we focus our minds on in order to practice living out our relationship with God (Ephesians 4:9). It’s easy to say that we should do that and we often feel like we want to do that, but sometimes it’s easier said than done. When we feel dark and down and heavy, it’s hard to choose to focus on light and good and easy. In Psalm 6, David gives us an example of how he choose to focus on the good even during a bad situation. Hint: it may not be what you think it is. In verses 6 and 7 of Psalm 6, David says, “I am weary with my moaning; every night I flood my bed with tears; I drench my couch with my weeping. My eye wastes away because of grief; it grows weak because of all my foes.” If you thinking of focusing on the positive, this may not be something that you think he should say. How is he focusing on whatever is commendable, good, or lovely when he says this? One idea we hold sometimes is that not thinking about not lovely things means not acknowledging the things that aren’t lovely. Pretending you don’t see problems or pretending you don’t feel bad about something isn’t the same thing as focusing on the good. Ignoring the obvious or refusing to face certain truths doesn’t give us power or put us in a place to see God’s glory. In fact, I would propose that it is difficult or nearly impossible to find the real good in a situation without facing the bad. God is good, all the time, in all situations. He is real and He is there. If we aren’t willing to open our eyes to all of what there, we will miss out on seeing all of what God is capable of doing. Nothing about his circumstances makes David any less confident of God. It doesn’t make him doubt who God is or what God is doing in his life. Acknowledging troubles is a way to be honest before the Lord. Letting those troubles grow so big in your perspective that they block out your belief in the power of God is doubt. No matter what, we need to belief that God is who He says He is and that He’s doing what He’s promised to do. Let’s use our focus to acknowledge our circumstance, both good and bad, and choose to focus our minds on seeing Him in all areas of our life.